ArcSite offers a number of ways of removing objects from the canvas. This article covers Deleting and Trimming. While there is currently no explicit Erase tool, you can accomplish the same goal using one or both of the other options. Select one or more objects you want to delete. ArcSite's Trim feature allows you to remove sections of an object. A common question heard is "How do I cut an existing wall so I can place a window/ door in it? 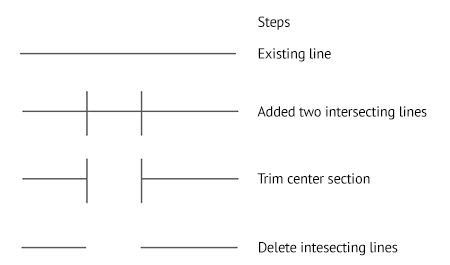 Using the Trim tool (described above) you can cut out any part of a line. You can undo one to multiple previous operations by tapping on the Undo arrow that appears in the top left corner of the canvas.